What exactly is proton beam therapy for lung cancer? When is this type of treatment used, what are the benefits and advantages relative to other treatments, and what are the possible side effects? Over half of people with lung cancer have some type of radiation therapy such as proton beam therapy during their journey. Conventional radiation therapy works by delivering high energy x-rays to a tumor. In contrast, proton beam therapy is a technique which delivers energy in the form of protons (positively charged particles) to an area of tissue to be destroyed. A particle accelerator is used to raise the energy needed to produce these protons. Due to the cost and space needed for a particle accelerator, only a handful of cancer centers offer this treatment in the United States and around the world. As noted above, proton beam therapy works by bombarding a tumor with positively charged particles called protons. The protons, in turn, cause damage to the genetic material of cancer cells in a tumor, resulting in the death of the cancer cells. The latest form of proton beam therapy, known as pencil beam scanning, uses spot scanning in order to send streams of protons back and forth through a tumor. How Does Proton Beam Therapy Differ From Conventional Radiation Therapy? Both conventional radiation therapy and proton beam therapy are prescribed and administered by a radiation oncologist, a cancer specialist who focuses on the treatment of cancer with radiation. In contrast to conventional radiation therapy, proton beam therapy focuses on a very precise area of tissue. This focused delivery not only allows for greater amounts of radiation to be used but results in less damage to nearby non-cancerous tissues. Damage to healthy tissues near a tumor results in most of the side effects, including some of the long term side effects such as the development of secondary cancers (cancers which are caused by the primary cancer treatment). One of the greatest advantages of proton beam therapy is being able to use it for tumors that are adjacent to critical structures, which could make surgery difficult or impossible. Proton beam therapy may also be used for those who could benefit from radiation therapy but have already received conventional radiation. When Is Proton Beam Therapy Used for Lung Cancer? There are a few different reasons why proton beam therapy may be recommended for those with lung cancer. With early stage lung cancer, which cannot be treated with lung cancer surgery, proton beam therapy may be an option. A lung tumor may be inoperable due to the location of the cancer near vital structures, or due to medical conditions which make surgery too risky. 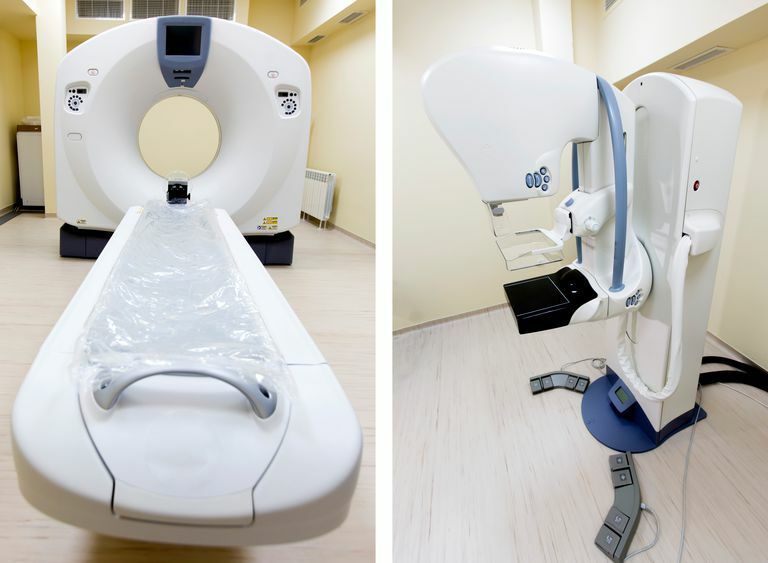 In this situation, an alternative treatment known as stereotactic body radiotherapy (SBRT) may also be used. Both of these procedures provide high amounts of radiation to a small and localized area of tissue. Both proton beam therapy and SBRT may be used with a curative intent. Proton beam therapy may also be an option for people who have had a recurrence of lung cancer but have already had radiation therapy. Proton beam therapy is not usually recommended for people with advanced lung cancer, such as stage 3B and stage 4 tumors. As with surgery, advanced lung cancers are usually better treated with other therapies such as chemotherapy, targeted therapies, or immunotherapy. Radiation pneumonitis: Radiation pneumonitis refers to an inflammation of the lungs related to treatment. It is very treatable (usually with steroids) but it's important to talk to your doctor about any coughing, change in your breathing, or shortness of breath so that testing can be done. Permanent loss of hair on the chest. Long term side effects and complications of proton beam therapy are not entirely clear as the treatment is relatively new compared with other forms of radiation therapy. Long term side effects of radiation therapy to the chest may include pulmonary fibrosis (scarring of the lungs which begins as radiation pneumonitis which is left untreated), secondary cancers (a cancer caused by the damage to genetic material in normal cells from treatment), and heart disease (including valve disease, coronary artery disease, cardiomyopathy, and abnormal heart rhythms) when radiation is given to the left side of the chest. In theory, these side effects should be less common than with conventional radiation therapy due to reduced damage to normal tissues, but it is too soon to know for sure. With general radiation therapy for lung cancer, smoking can make the treatment less effective and increase the possible side effects. Proton beam therapy may be affected by smoking as well. If you smoke, make sure to learn about the reasons why quitting smoking is important after a diagnosis of cancer. Proton beam therapy is given daily on weekdays for a total of around 30 visits. The number of visits may be longer or shorter depending on your particular cancer. Before proton beam therapy is started, you will have a preparation appointment with your radiation oncologists. Measurements are made via scans such as a CT scan to define precisely the area which should be radiated. You should plan on up to an hour for each visit, though the radiation therapy itself takes only a short period of time. You will be asked to underdress and will be fitted with an immobilization device on your chest for each visit. The device will be made during your initial planning appointment. After you have completed all of your treatments, you will follow up with your medical oncologist. A follow-up scan at that time will be done to see how well the proton therapy worked. Scans may also be done while you are receiving your treatments if you have any worsening of symptoms. Are there any alternative treatments which may be just as effective? What is the cost of treatment? Will insurance cover my treatment or will I have out of pocket costs? How many treatments will I need to have altogether? Why? If you must travel for your treatments, ask your oncology nurse or another professional at your cancer center what lodging options are available. Some cancer centers, such as the Mayo Clinic in Rochester, Minnesota, have lodging at a reduced cost or even free. What are the side effects I might expect? What have your other patients said about their treatments? How many people have you treated with proton beam therapy? Proton beam therapy is a newer treatment approach that may be used for some people with lung cancer. It's most commonly used for early stage non-small cell lung cancer, which is potentially curable, but which is in a difficult location to access safely with surgery or if a person who has medical conditions which raise the risk of surgery. The most common side effect is fatigue, but it's felt that the side effects will probably be more tolerable than with conventional radiation therapy, especially with newer forms of proton beam therapy such as pencil beam scanning. Since there are a limited number of areas where this procedure can be done, it may be difficult for some people who live far from these centers, especially when treatments are needed daily for several weeks. At the current time, there is some controversy over the real benefit of proton beam therapy given the cost. Proton beam therapy may cost at least twice as much as conventional radiation therapy, and the costs of housing, travel, and time off work for those who must travel can be high. Consider all aspects of treatment before choosing one that's right for you. Diwangi, T., Mohindra, P., Vyfhuis, M. et al. Advances in Radiotherapy Techniques and Delivery for Non-Small Cell Lung Cancer: Benefits of Intensity-Modulated Radiation Therapy, Proton Therapy, and Stereotactic Body Radiation. Translational Lung Cancer Research. 2017. 6(2):131-147. Mohan, R., and D. Grosshans. Proton Therapy- Present and Future. Advanced Drug Delivery Reviews. 2017. 109:26-44.